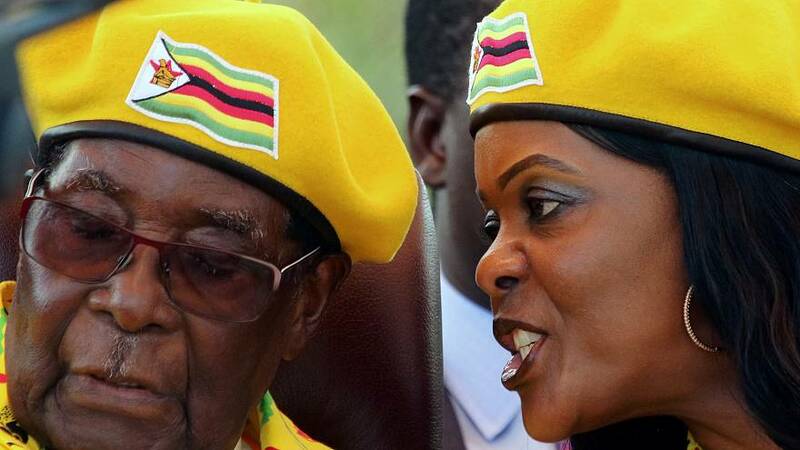 After decades ruling Zimbabwe with a firm grip, could Robert Mugabe’s weakness have been his wife? Grace Mugabe, 52, is a political novice whose bid to succeed her 93-year-old husband upset the old guard and prompted the army to take over. She effectively accelerated her husband’s downfall, says Peter Godwin, a journalist and author born and raised in Zimbabwe. “Mugabe is now 93, he’s increasingly enfeebled and doddery, and his young wife made a bid to replace him, to be his successor. And the old guard of the party, his old comrades from the independence war, didn’t like that. So this is them reasserting their authority,” he summed up in an interview. “About two years ago it became apparent she had leadership designs on the ruling party herself. These divisions between her and the old guard have become increasingly fractious, belligerent and aggressive. They’ve become increasingly public, played out in the media and at rallies. She’s humiliated and insulted the military leadership and the old guard of the party,” he added. The First Lady has also often been criticised for her extravagant expenses and taste for shopping. “Grace Mugabe is not popular at all. She’s called ‘Gucci Grace’, ‘the First Shopper’, ‘DisGrace’. She’s a very polarising and generally unpopular character. She’s seen as a gold digger, a carpet bagger, an arriviste. She’s deeply unpopular,” said Godwin. Godwin and other analysts believe it’s now a matter of days before Mugabe, who’s been under house arrest, steps down. Experts say the army appears to want Mugabe, who has ruled Zimbabwe since independence in 1980, to go quietly and allow a smooth and bloodless transition to Emmerson Mnangagwa, the vice president Mugabe sacked last week to push forward his wife Grace, triggering the political crisis. “I think at the moment what they’re trying to negotiate is kind of his (Mugabe’s) exit package,” said Godwin. “Does he get to stay in the country? Does he get to resign and resign as though it’s kind of voluntary – when it’s obvious that it’s not? Does he go to South Africa? There’s quite a lot of details that have got to be hammered out. And also the shape of what replaces them: is it a transitional government, a government of national unity? Zimbabwean intelligence reports seen by the Reuters news agency suggest Mugabe’s exit was in the planning for more than a year, with Mnangagwa, a former security chief and lifelong Mugabe confidant nicknamed “The Crocodile” being the key player. According to the files and political sources in Zimbabwe and South Africa, once Mugabe’s resignation is secured, Mnangagwa would take over as president of an interim unity government that would seek to stabilise the imploding economy. On Thursday, Tsvangirai called for Mugabe to resign “in the interest of the people”.